This new addition to the Dear America series written by Susan Campbell Bartoletti is a whirlwind of adventure and survival. There is no need for dystopian when we take into account the true stories from our own past. 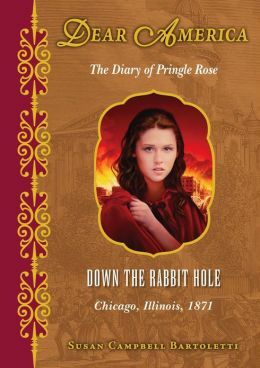 Pringle Rose is a fourteen girl who has been raised in every comfort in the coal rich city of Scranton, PA in 1871. Her father owns one of the large collieries and is not about to be pushed around by some new labor union threats. Unfortunately, he and his wife are killed in a tragic carriage accident leaving Pringle and her brother Gideon alone in the world with a greedy uncle and a mean aunt. In order to save her Down Syndrome brother from being institutionalized, Pringle and Gideon run away. While these two children are made up characters, the struggles between mine owners and mine workers was very real. Bartoletti skillfully tells both sides of the story in very personal ways that will lead to thoughts and discussions about how difficult life was at that time. The children travel half way across the country on a train by themselves in search of an old family friend. They end up living in Chicago and experience, dramatically the great fire. It is a masterfully written story that will grip fourth, fifth and sixth grade readers as well as anyone who picks it up. The core curriculum and literacy skills can be met on practically every page as the author’s research is so thorough. She has included the transportation of the time, the medical misunderstandings of Down Syndrome, boarding schools, mine owners, mine labor unions, the Chicago fire and a trust fund that requires a person to be twenty one years old to inherit from parents. The writing is clear and precise. Included are many actual places and dates. Librarians and teachers will be able to use this text to begin or conclude studies about the coal region, railroads in America or the Chicago fire that brought about serious changes in building codes all across the country.